When looking for accent items for your living room, foyer or kitchen, consider decorative wine bottles. A wine bottle can be transformed into something more than the typical lamp or candle holder. Decorative bottles may have unusual features, such as hand painted designs, delicate miniature lights or even hand-blown glass design features. If you haven't seen today's decorative wine bottles, you may be surprised. These bottles come in various sizes, colors and shapes. Many of these decorative bottles are designed to be lit from within. Crafters add dozens of miniature lights to the interior of the bottle so that the unique design features of the bottle are backlit. The result is a subtle, yet beautiful, wine bottle that you can use in a variety of settings. 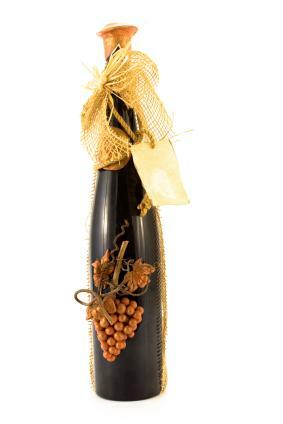 A popular decorative wine bottle is the hand painted variety. Artists paint these bottles by hand, not machine, with unique designs. Common design themes include sports teams, flowers, clothing (such as tuxedos or evening dresses), holidays, planets and stars.Gifted artists may create these bottles from scratch with acrylic paints found at a local arts and crafts store. Often, people find empty wine bottles at local garage sales or purchase them from a glass company that sells new wine bottles. For those that don't want to hand paint a wine bottle themselves, these fanciful bottles may be found at boutique stores, wine stores and various art sites online. The bottles may be filled with your own homemade wine or vinegars, bath salts, flowers or lit from within with miniature lights. These elements may be added to the outside of the bottle to create patterns such as grape clusters or flowers, which give a multi-dimensional appearance to the bottle. Decorated bottles may be dipped in polyurethane to preserve the artwork. Another popular art form is the etched wine bottle. For presentation, these bottles add a touch of class to any gift-giving occasion. These bottles are also very collectible. While you may find etched wine bottles at your local wine store (usually during the holidays), they can be obtained from other sources as well. Popular places to find these types of bottles include art shows, gallery hops and from bottle etching artists selling them online. Belgian or Dutch bottle- Dated between 1700 and 1730. Commonly used for rum, wine and sparkling wines. They are a medium olive color. Black glass - Made in America between 1847 and 1845 by the New England Glass Bottle Company. The glass is made from a combination of dark olive and amber colors. Chestnut Flask - Named for the shape of the bottle, was produced in New England between 1790 and 1820 and has a medium olive color. Early English Onion - Also named for the shape of the bottle, were manufactured in America between 1680 and 1720. They were made of dark, olive green glass. Whether you choose antique bottles or opt for the newer, hand painted bottles, these unique items will look at home in almost any setting. They also make great wine related gifts for friends and family on any occasion.